It is Christmas time and a good time is had by all. 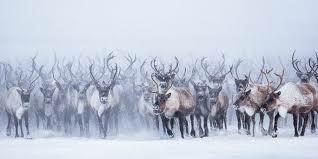 As everone knows; Santaclaus has reindeer and one of them has a red nose. The notion of Santa is based on a Dutch tradition "Sinterklaas" and everybody knows that he arrives by steam boat from Madrid accompanied by "Zwarte Piet" and comes loaded with presents for all the children who have been good. It is all part of winter celebrations, Santaclaus is firmly associated with Christmas and it is well documented that Jezus was not born on this day so many centuries ago. When you start to evaluate belief and find things to criticise you can and may do so. However, it is easily understood why this is not appreciated at all. People want to believe in a Jezus that did not look at all like how it is usually depicted. The fact that Santa comes from the North pole found a lot of cheer thanks to Norad and I read an amusing story that Rudolphs red nose is due to bioluminism. There is a lack of appreciation for "black pete" as some consider it an example of "Blackface". Do read the Wikipedia article, its origin is in a USA when slavery was alive and well. The Netherlands has a different culture; Zwarte Piet is clothed in seventeenth century garb he brings presents through the chimney but is always spotless. He is a smart, hardworking guy and only thanks to Zwarte Piet Sinterklaas can bring presents to all the children of the Netherlands. Remember, the Netherlands were Spanish until the seventeenth century. Like in any belief system; those who truly belief benefit the most. When children are of an age when they will start to suspect that Sinterklaas is a ruse, they will be informed about the awful truth. When they no longer belief, when they are "gortig", they are expected to make surprises for their peers. They may share in the fun of a truly Dutch tradition. For those who object, the German term "hineininterpretieren" fits the application of blackface to Zwarte Piet.